I am the voice of your Emperor and by His command I order you to walk among the living once more, to be my hounds and hunters and to reap the souls of those who would betray His Imperium. Those who trespass against the glorious Imperial dead shall be hounded forever more by vengeful wraiths. – from the Codex Phantasma, put to the torch by Inquisitorial edict. Forge for me a servo-construct, to house in flesh and iron these furious ghosts, these wrathful spirits. Let them serve from beyond the grave and redeem the failures that dogged them in life. Let all who witness them know that duty does not end in death! Remember the skullcrab from Black Edge I painted way back in June? It’s just a cracking little model, packed with character – what could better encapsulate the essence of 40k than a tiny robot-spider made from someone’s skull (presumably someone with quite a big head mind you)? Alas, for various reasons, the other two skullcrabs have sat untouched ever since. Inspired by the skullbirds however I realised it was time to expand my collection of skull-headed fauna and finally get them painted. A group shot of the three finished skulls together. Checking the Black Edge store I notice that the skullcrabs aren’t currently available – although I’m hopeful that Mark (of HeresyOfUs – and the man behind Black Edge) is working on them, alongside his various other twisted and brilliant creations. As the Imperial forces advance a scuttling wave of skullcrabs travels ahead of them. Whilst I had skulls on the brain (surely a normal state of affairs) I nabbed this servo-skull for a quick repaint as well. You really can’t have too many cherubs, servo-skulls and other skull-faced cyber-creatures in 40k so I’ll try to build some more in the near(-ish) future – watch this space! 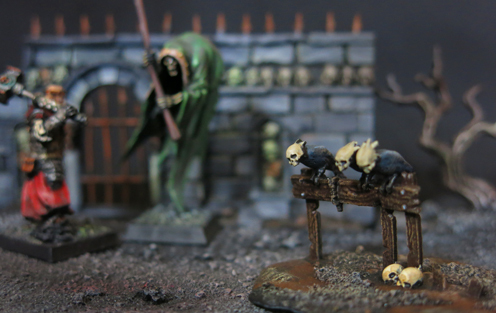 This post is basically a plug for a mate but it’s also a hearty endorsement of an excellent new source of wonderfully gothic accoutrements for our hobby. Plus I just finished painting some skull-faced wildlife and that’s something everyone needs more of in their lives! Followers of this blog will know I’m a long-standing fan of the blog Heresy of Us, especially Mark’s use of 3D printed components which he designs to include in his models. A new frontier has opened up in the hobby and, although I doubt that greenstuff is going anywhere, the arrival of a new creative medium is something to celebrate. 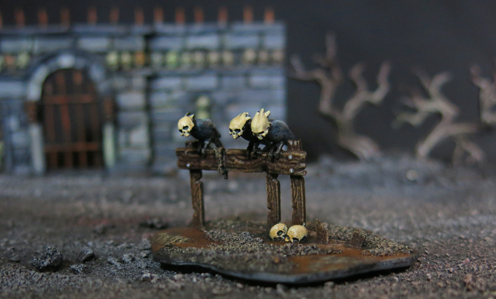 Excitingly Mark now has a store, Black Edge 3D, where you can buy some of his designs, so I took the chance to get myself a set of his skullbirds as I’ve had my eye on them ever since I spotted them in pictures from the Chapel game last autumn. They add a touch of the gothic to any 41st Millennium battlefield. And of course they also look rather fitting in the darker corners of the Mortal Realms (or the Warhammer world if you’re old fashioned like me). I planned this model to be my second contribution to Fembruary, alongside the genestealer hunting Imperial agent I showed previously, although truth be told she could equally fit in with Azazel’s call to make February “finish a neglected model month” as she’s been sitting untouched and unloved for almost a year. The wait is over however and, with both community challenges chaining me to my painting desk she’s finished at long last. My aim for Fembruary was to paint powerful, non-sexualised women and I like to think that nothing ticks that box quite so well as a thousand year old, possibly possessed witch. Of course, continuing the theme of cross-over projects and community challenges that seems to surround this model, she was originally envisioned as part of HeresyOfUs’ Chapel project. However as the rest of my Ordo Mors warband continues to languish in unpainted purgatory here she is with a squad of Imperial guardsmen for company. How the poor guardsmen feel about this we can only guess. Last time I talked about the Ordo Mors I mentioned that there was another character in the works, a scout. At the time he was nowhere near ready to show you, in fact he was looking pretty terrible, and the only reason I mentioned him at all was by way of goading myself into finishing him as opposed to having a temper tantrum and giving up entirely. However I’ve persevered and here he is, ready to seek out a path for Morix and his retinue. Of all the characters I’ve made for this warband he’s probably the one which has pushed my skills the furthest, not least because the main body of his horse is almost entirely sculpted from greenstuff. It’s now time for the whole retinue to hit the painting desk, although of course there’s still time for last minute feedback and suggestions. 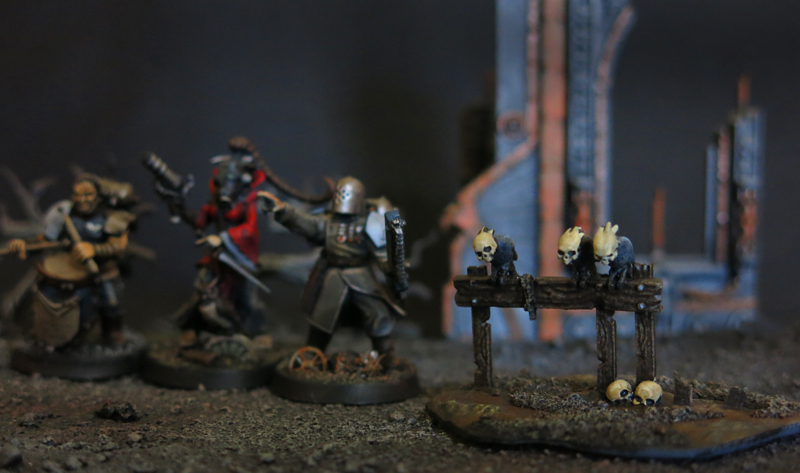 Something I was keen to emphasis with my Inquisitorial retinue for the Chapel is the “aloneness” of Inquisitor Morix. Here is a man who’s dedicated his life to rooting out heresy and specifically to working with the dead. 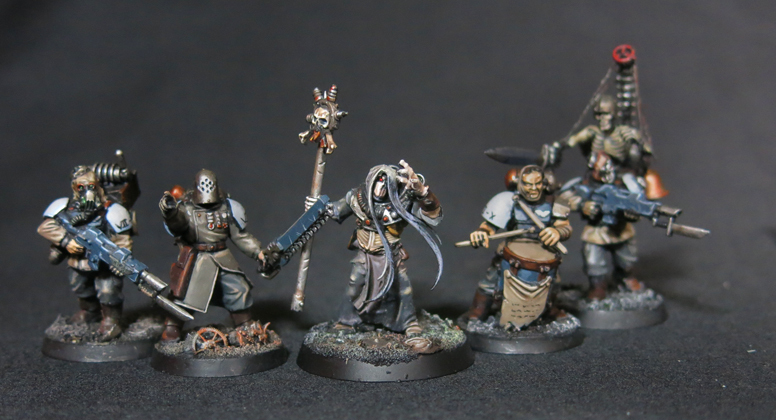 Whilst many Inquisitorial warbands are made up of a cavalcade of crazy characters I felt that having too many friends and sidekicks along for the ride would reduce the sense of isolation I wanted to imbue him with. Of course he does have a few acolytes but I wanted to avoid creating a sense of community around him. Ultimately this isn’t the story of a group of friends fighting crime in the 41st Millennium, it’s the story of Inquisitor Morix and the others are very much just the supporting cast. Without him the group wouldn’t struggle onwards to complete his final mission, or return his body to Terra. They would simply scatter to pursue their own agendas. As an aside I’ve often fancied putting together a retinue that leaned heavily on the traditional Inquisitorial tropes and my initial idea for this project was to make a group of Chapter-serfs tasked with the returning the body of the Space Marine they had served to be interred in the Chapel. Perhaps someday these projects will come together but in the meantime Morix is where the action is. Of course, this is all very well but how to maintain the remoteness of Morix once I started on the rank and file of the warband? As the population of the warband grew it would be harder and harder to maintain the sense that Morix was in it alone. 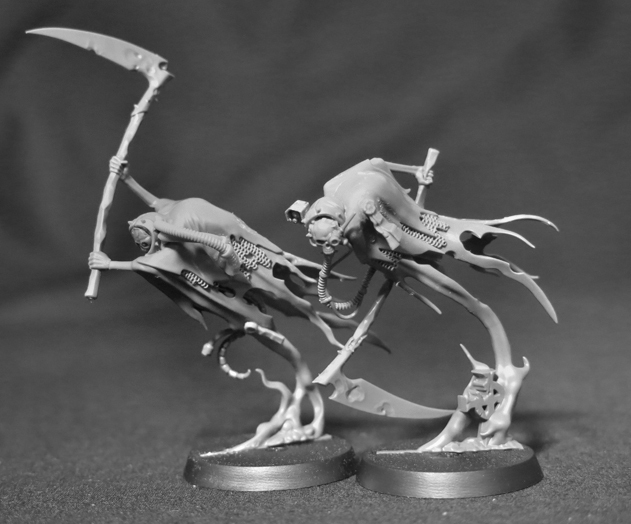 For a while I toyed with the idea of undead servitors but in the end the option I went for was to unleash the dogs. I’ve always liked the idea of cyber-hounds but until GW gets around to making them (maybe if they add Arbites to Necromunda he said wishfully) the only option was to grab a set of gryph hounds and a load of greenstuff and make my own. Do keep in mind that these are all WIPs at the moment. For instance I’m still working out exactly what’s going on with the cables on the pack alpha’s head. I know it’s been a while since I’ve shown anything of my Chapel warband (insert appropriate excuses about the busyness of real life here) but that doesn’t mean I’ve been idle. Indeed my determination to bring my best work to the project has seen me putting in many hours tinkering away with the various members of Inquistior Morix’s retinue – but has also meant that whenever work and life have piled on the pressure I’ve been content to turn my attention to more straightforward projects, rather than burdening myself with an additional suite of challenges. Plus, as the initial Chapel game has been and gone, there’s no particular hurry to get them finished, no looming deadline encouraging me to put in long nocturnal hours with brush in hand when I’m already putting in long diurnal (mostly) hours at work. That said there’s plans for a return to the Chapel and as ever the Imperium may be slow to respond but with xenos, witches and unquiet spirits alike abroad in the Emperor’s domain the arrival of Inquisitorial sanction remains inevitable. 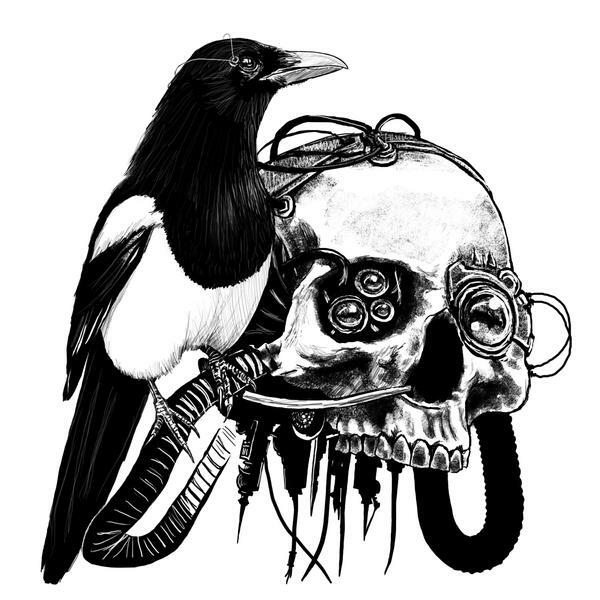 Last time I showed pictures of Morix (back in July dare I admit it) I noted that the “skellie-bird”, his cyber-familiar which had been perched on his fist in the earliest WIPs had flown off somewhere but would be returning “shortly”. Who knew then that “shortly” would turn out to be such a long time away? Not I that’s for sure. However I’m pleased to announce that he’s back at last, perched where he belongs, and undoubtedly chattering secrets into his master’s ear. However he doesn’t need to sit there permanently. After all his role is to be a spy and a scout and to do that he must be able to flit away, leaving his master looking as though he’s punching someone whilst looking the other way and shouting. Where then does the skellie-bird go when he’s not at Morix’s side? Naturally he needed a perch from which he can spy out the route ahead or listen in on the whispered conversations of those who believe themselves free from the pitiless gaze of the Inquisition. Inspired by pictures of the Albino Woods board I put together this warped, bio-mechanical tree. Without wishing to over promise and under deliver I’m planning to show some pictures of the rest of Morix’s retinue before the end of the week – in the meantime any thoughts or feedback you have on the bid and his perch are much appreciated.